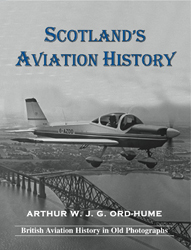 Arthur’s new book, he tells us, fills a gap in the market because this is the first book to properly tell the whole story of the development of aviation in Scotland, starting 400 years ago! Although mainly dealing with the era of powered flight, the story begins with early attempts to fly by Scottish man, then looks at ballooning. However, the main focus of the book is the 20th century, starting with the Lanark 1910 meeting and the 1911 Daily Mail Air Race. Pioneer aviation is swiftly followed by the First World War and the activities of the Royal Flying Corps at Montrose and elsewhere. The post-war development of civil aviation continues the story with the opening of airports, island services, helicopters and more. Readers unfamiliar with Ord-Hume’s style will discover a witty writer who at the same time produces a coherent and intelligent narrative, a tricky task for a subject as complex as this, possibly explaining why lesser authors have shied away from attempting it. Arthur’s idea of telling the story succinctly is this book, over 200 photos and an introduction that runs to page 55. Only Arthur of all our authors would do this. This book is packed with over 200 photographs – any remaining white space is crammed full of lengthy and detailed captions by a man who knows his subject (he even designed his own plane – the Luton Minor – and he will sell you plans if you want to build one in your shed).